Savory Pacific Northwest Smoked Salmon. Handmade artisan cheese. Send this gorgeous, lined woven wood gift basket that’s filled with freshly harvested pears and crisp juicy apples, handmade artisan cheese from Bellwether Farms®, Carr’s® Water Crackers, roasted and salted mixed nuts and much more. It’s decadent, and delightfully easy to share and comes from the fertile orchards along the River Deltas of Northern California's Sacramento Valley, so you know it will always be orchard-fresh, ripe and ready to eat. Later, the basket makes great storage for their favorite bedside books! Savory Pacific Northwest Smoked Salmon. Handmade artisan cheese. 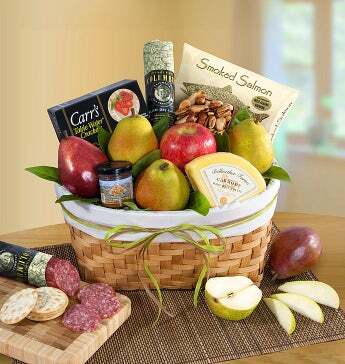 Send this gorgeous, lined woven wood fruit gift basket that's filled with freshly harvested pears and crisp juicy apples, handmade artisan cheese from Bellwether Farms®, Carr’s® Water Crackers, roasted and salted mixed nuts and much more.